I messed with the ingredients, trying to incorporate some buttermilk I had around, and ended up with that spectacularly crumb-y texture for which I set off looking. It keeps well and travels well, too. This is the kind of cake just asking you to cut a thin slice, pour a cup of coffee, and watch the sun rise. Cream together butter, sugar, vanilla, rum, egg yolks, and buttermilk. Mix dry ingredients together and stir gradually into butter-sugar-egg mixture. The batter will be quite thick, almost like cookie dough. If it seems too thick and dry, add a bit more buttermilk. Smooth batter into a buttered 10-inch cast iron skillet (or, alternatively, a 9-inch springform pan). Firmly stud the surface of the batter with the halved cherries, as densely or sparsely scattered as you’d like. There will be some oozing juice. This is a good thing. Bake for 20-40 minutes (really depends on your pan size). The cake will be light-golden on top. Keep an eye on it; you still want your cake to be tender, and if cooking in cast iron, it will still bake a bit more when it comes out of the oven. Never heard of clafoutis but it looks perfect for a simple family gatherings tomorrow. I’m also away from my kitchen for a little while, so I feel for you. Chapel Hill apparently has an amazing farmers’ market, but I’m stuck in a pretty standard hotel room catching up on some work from the spring. I hope at least that I might get a chance to rent a car this weekend and head to the beach! Looking forward to when you’re back in your kitchen and here with another post. Aw, thanks Katie. Back now! p.s. Dying to see the final claw-foot tub photos…. I would love to hear more about your childhood and your mother, they both sound exotic and exciting. This gem of a recipe is in my oven now. I have always wanted to make a clafoutis and this looked like a perfect place to start! I just stumbled upon you’re blog and I’m utterly in love! So simple, understated and I love you’re photographs and recipes selections. I will be coming back often! Thank You!! 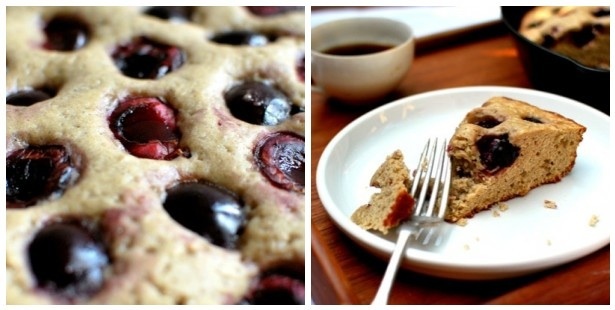 You are currently reading Cherry buckwheat clafoutis at The Yellow House.